B2B “Social” – Industry Example. Kudos to Cobalt. Last Monday I was going through my normal Monday morning Twitter catch up. Making sure I didn’t miss anything of importance over the weekend. As I was browsing my stream, a particular tweet happen to catch my eye. 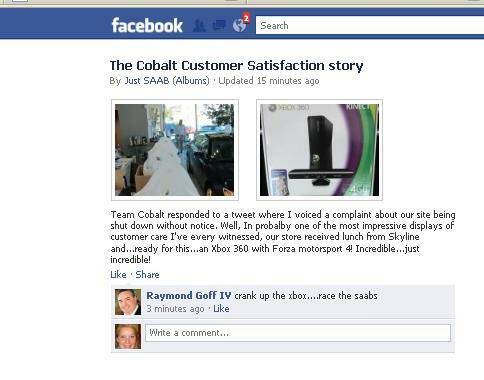 Just Saab had posted a small rant about Cobalt turning off their dealerships’ splash page with no warning of doing so. Ouch! At the same time they grounded Cobalt, expressed their new love for Dealer.com. I’m sure Dealer.com was loving this. Apparently someone from Cobalt’s team (I had a feeling I knew who this might be) had caught the tweet and contacted Just Saab, verifying that Cobalt had indeed messed up. They took down the 2 dealerships’ splash page with no warning, and with no way of reversing the removal of the page. 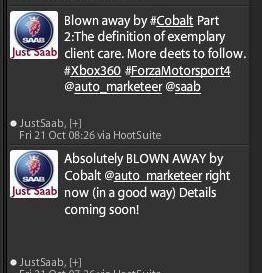 At that point, (speaking with Jade) the Cobalt marketing department made the decision to send Just Saab an Xbox System and Forza Motorsport 4. Since the entire dealership was affected, not just this one individual, they sent over Skyline Chili lunch for the whole dealership the Friday after. Is this a sign of a new, more dealer-centric Cobalt? This reminded me of the awesome Gary Vaynerchuk Keynote speech at DSES. Word of mouth is the strongest form of marketing and today’s word of mouth is online. However, business/dealers continue to spend money on traditional forms of marketing hoping to win the sprint while not conditioning for the marathon. Are you following your dealerships reputation on Facebook and Twitter? DOWN TIME – Time for an Upgrade! we will be performing some server upgrades to handle the increased amount of traffic we have received over the last several months. The Blog and the forum will be experiencing some down time over the weekend. Please stick with us while we complete this upgrade and cross your fingers for no hiccups. If not for a camera and a process, I wouldn’t be writing this article behind a desk inside a publically traded company. eCarList’s founder, Len Critcher, sold over 6,000 cars online with a camera and two porters…oh, and some incredible software developed in-house to merchandise and distribute his vehicles to the web. Chances are you have access to all of the above, and with the capability of apps and megapixels in the smartphones of today, dealers are running out of excuses as to why they are not taking ownership of what could arguably be considered the most important phase of marketing a vehicle – photography and merchandising. Len’s famous rhetorical question to dealers, “does the Gap hire outside contractors to come in and fold their T-shirts?”, led us to conduct our own study. In short, we studied a sample of franchise dealers who have an internal photography process vs. those who outsource it. 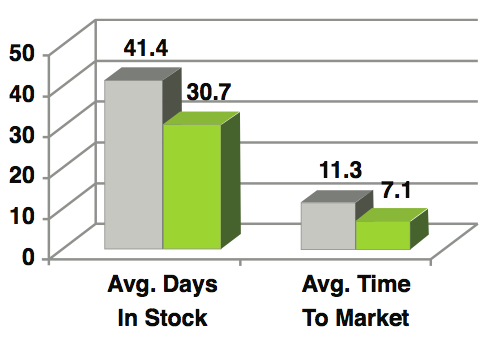 The results showed an average profit increase of $288K based on decreased time-to-market and days-in-stock (not including the actual cost of your outsourced vendor). We understand every dealer has their own set of circumstances, but for those that have the potential and the desire to merchandise more effectively, we also put together a quick-guide on how to setup a photo booth inside your dealership, courtesy of our in-house “film crew”. Here are some findings from our study OR you can download our full study “eCarList Photography Study“. Are your vehicles being merchandised / photoed In-House or Out-Sourced? What has worked best for you and your dealership? Our long time sponsor Contact At Once is hosting a CONTEST for the DealerRefresh community and our reader base. They’re looking for your best advice on gaining appointments and selling to a chat prospect…. What are some of the proven ways you’ve found to turn a website ‘looker’ into an appointment or even a sale using chat? They are even going throw in a $10 Starbucks Gift Card for every individual that participates and a $100 Starbucks Gift Card for each of the individuals whose tips make it into their Top 5. More than just a great contest, sharing the best techniques will help others become more effective at using chat to GAIN APPOINTMENTS and OBTAIN MORE SELL CARS. Post your single best tip for selling to a chat prospect to this forum (one submission per person). Include a chat transcript demonstrating the technique mentioned in your tip (screen shot or cut-and-paste, just be sure to remove or obscure any customer personal information). Include your full name along with the name of your dealership. Don’t forget to watch the Contact At Once! Facebook Fan Page where the 5 winners will be announced! 1. Did You Receive Your Google Places Notice? – For many of us, managing our dealers Google Places page proves to be a real challenge. Brian Pasch offers some advise and links to help out. 2. Digital Dealer 11 Review by Kevin Frye – In traditional format, Kevin offers up his review of the 11th Digital Dealer Conference. The conference continues to get better and better. 3. Satisfy Me! – Jerry Thibeau offers a real story on customer service. What 8 areas do most dealers miss out on customer service? 4. It’s Not the Length, But How You Use It – A title like that could only come from our favorite Joe Webb. In this article Joe talks about about quality, not quantity. It’s the only true way to measure greatness. 5. Will AutoTrader Build An Exclusive ZMOT Data Network? – Will Dataium Revolutionize Automotive Digital Marketing and the Role of CRM? We’ve had some stellar discussion in the forums over the last week. Be sure to review and weigh-in! 1. How Many Calls Do You Expect Your ISMs to Make? – From cradle to grave or in the BDC – how many follow-up calls do you expect from your team? 2. Highlights from Vegas? – If you attended Digital Dealer 11 or DSES in Vegas, lets us know what you liked the most about each conference. 4. QR Codes – In or Out? – The QR thread that never dies. What are you doing with QR? We’re working on a review of Driving Sales Executive Summit – it was a great conference (one of the best I have ever attended for our industry), we’re not sure where to start. 1. DealerFire is offering 10-pack of professional services for dealers now available for $499, that’s half off! 2. 1to1News is offering 2 months of newsletter service for your dealership. If you have been thinking about adding a newsletter into your marketing mix – this would be a great time to test out a great service. Dealers using HomeNet’s flagship product, the Inventory Online (IOL) Vehicle Marketing Suite, can now publish selected used vehicle inventory on OPENLANE’s Open Auction to sell their vehicles wholesale to a nationwide audience of more than 25,000 franchise and independent dealers on a 24–hour basis, 7 days a week. Through this partnership, HomeNet users now have a quick and seamless way to control the distribution of both retail and wholesale units from one convenient platform, saving time and money and providing maximum exposure for vehicles for sale. From within IOL, dealers are able to publish their wholesale used vehicle units to OPENLANE’s Open Auction with one simple click and manage their entire online inventory from one centralized location. Did You Receive Your Google Places Notice? It is nothing new to say that Google Places can be a pain in the neck especially if you have multiple franchises located at the same physical address. PCG has been working with the industry to educate, assist, and correct Google Places pages so that they can be leveraged during the Zero Moment of Truth. Once a dealer’s Google Places page is setup properly, they can start to use Google Adwords Express. Adwords Express could be the BEST PPC strategy a dealer could leverage, if the dealership has strong reviews. Google Places Team have recently been sending out letters about updating information on Google Maps and Places. This is causing a stir, so let me advise you to be calm. The notices are part of a transition that Google has in mind that will eventually transform what we know as Google Places to something better. Google now has a documented escalation process and trouble ticket system that is fixing Google Places issues in a timely manner. In fact, Google has been listening to dealers and in the coming months you will see that Google does want businesses to control and leverage their business pages. The visibility, traffic, and advertising opportunities with Google Places FAR outweighs some of the pain that dealers experience as Google Places is transformed. As consumers continue to embrace the critical importance of dealer reviews in the car shopping process, DealerRater reports impressive web site statistics in Q3 2011, with strong growth demonstrated in total visitor traffic and page views as well as new visitor counts consistently climbing by 66% every three months in 2011. Waltham, Mass. – October 3, 2011 – DealerRater®, the nation’s premier car dealer review website, today announced sustained and impressive growth in web site traffic at the close of third quarter 2011. Total visits to DealerRater.com have increased 39% since January, while page views have climbed 27% to over seven million. While all web analytics are indicative of DealerRater’s top position as an online resource on car dealerships, the statistic most telling of DealerRater’s growing popularity among auto consumers is the number of new site visits, which has jumped an average of 66% every three months in 2011. DealerRater’s registered user base has more than doubled for two consecutive years, increasing to over 330,000 registered users. With a growing network of registered users, DealerRater has built an ever expanding database of more than 450,000 car dealer reviews and 41,000 U.S. and Canadian car dealerships. Through its Certification Program, DealerRater provides car dealers with access to an ever expanding market of potential auto customers who place importance on quality sales and service. DealerRater was founded in 2002 as the first car dealer review website worldwide. DealerRater is the world’s #1 online resource for anyone seeking third-party information on automobile dealerships. DealerRater features more than 41,000 U.S. and International car dealers, 450,000 user reviews and over 1,000,000 cars for sale. DealerRater attracts more than 5 million consumers every year who visit the site to search for car dealerships, read current reviews, write their own descriptive reviews, and find car deals – all for free. Car dealers are rated on the criteria of customer service, quality of work, friendliness, price and overall experience. In addition, DealerRater offers qualified car dealers a Certified Dealer Program as a reputation management tool to help them grow their online presence and achieve higher SEO rankings across the Web. Today, more than 4,100 dealers are members of DealerRater’s Certification Program. For more information, visit www.DealerRater.com or call 800-266-9455. DrivingSales (http://www.drivingsales.com) presented Dominion Dealer Solutions’ CarBinder with the DrivingSales Innovation Cup Award for the most innovative dealership solution of 2011 at this week’s DrivingSales Executive Summit in Las Vegas. The Second Annual DrivingSales Innovation Cup Awards were created to recognize solutions introduced or enhanced in 2011 whose innovative approaches have produced significant results for dealership customers. Dealership solution-providers submitted applications online, vendor names were blanked out, and a panel of dealers assessed each application. Six were selected from dozens of online applicants to present onstage at the Third Annual DrivingSales Executive Summit, where a panel of dealers scored each solution. Dominion Dealer Solutions’ CarBinder received the highest score. AdVantageTec AV11, Cars.com Dealer Reviews, cDemo Mobile Solutions Mobile Inspector (Mi), DealerTrend CarDealerPress.com, and MotorLot eSignature were named as finalists. The winner and finalist will be profiled at DrivingSales.com and in the DrivingSales newsletter, and will also be featured in a video interview at DrivingSalesTV. For more information about the DrivingSales Innovation Cup Awards, go to: http://www.drivingsalesinnovationcup.com/. DrivingSales is the auto industry’s fastest-growing, most influential trade media property focused on delivering actionable profit-building information to auto retailers and industry professionals. DrivingSales’ media network includes flagship property DrivingSales.com (http://www.drivingsales.com), the world’s largest car dealer social network where thousands of dealership professionals collaborate and share best practices in a 20-group style setting; DrivingSalesTV (http://www.drivingsalestv.com), an interactive web channel which helps car dealers and auto professionals keep tabs on their industry and emerging technologies 24/7; DrivingSales University, an on-demand training platform where dealerships learn the latest web strategies from top e-commerce experts; DrivingSales Executive Summit (DSES) the industry’s leading conference where progressive dealers collaborate and learn from world renowned experts, and DrivingSales Dealership Innovation Guide, a quarterly free publication featuring case studies of the industry’s most innovative dealerships, solutions and best practices.